The rain barrel, the most commonly used equipment for the harvesting of rainwater, collects rain for outdoor, non-potable water uses such as watering gardens or even for rinsing off your car. Building your own barrel is easy and an excellent way to conserve water at home. At Clarkson, I worked alongside Chelsea Farinacci and advisors Sue Powers and Amanda Lavigne, of the ISE, to expand water conservation on campus by using harvested water to flush toilets. Our hope is that one day rainwater collection could be used generally in community planning, which would save not only water but energy and money. Going beyond the rain barrel is about incorporating external water sources -- -- alternative sources not connected to the residential plumbing system -- into the future internal plumbing of homes for uses other than drinking water. As shown in the image, the barrelconnects to the rain gutter and a collection container equipped with a spigot. Once connected to home plumbing, it will allow the rainwater to power porcelain thrones – in other words, the system we are developing at ISE will allow non-potable water to flush our toilets. Approximately 27% of a household’s water use comes from flushing the toilet. The average person uses about 20 gallons a day in toilet flushes (EPA 2014). The United States population was at 316.1 million in 2013. That makes approximately 5.75 billion gallons of water being flushed each day in the U.S. (Population 2013). All this is going on top of more frequent droughts. Currently the solution to droughts is to “use backup sources in different watersheds/recharge zones” (EPA 2014). If rainwater collection and use becomes more widespread, communities will be more adapt for drought, and our aquifers will not be depleted as quickly. The rain replenishes the aquifer over time it does not immediately add to the supply. Rainwater must go through obstacles before reaching groundwater, such as flowing through the soil where it can be taken up by plant roots, insects, and microbes. With our system we collect rainwater directly from our roofs rather than with the energy-draining process of pumping it out of the ground. The water would still remain in cycle and the amount of water contributing to the wastewater treatment plant would remain the same. This process does not account for the possible decrease in water to our ecosystems. But the amount of rain captured is much less than storm water that runs off homes and impervious surfaces into the local environment or, in many cases, into stormwater systems. 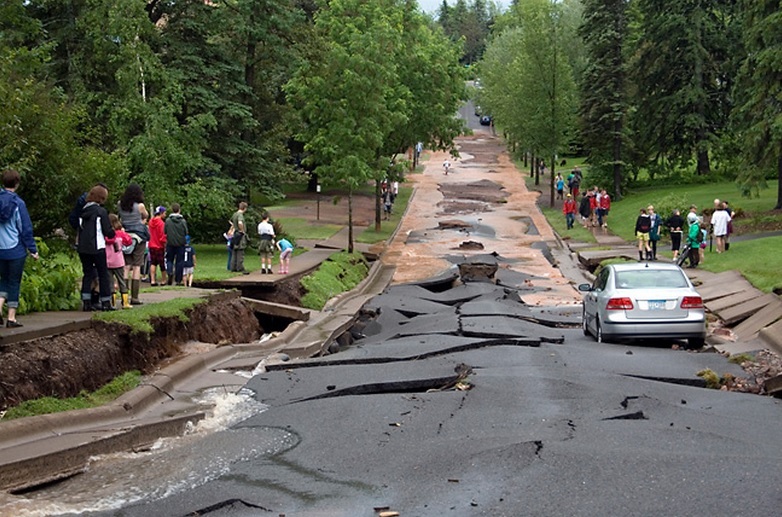 Run off is a common problem that arises with impervious surfaces that cause rain water to buildup and mold surfaces which have a negative effect on infrastructure. In some cases, however, capturing rain is a tradeoff that must be measured against its impact on the balance of local ecosystems. There are current systems in place that use a lot of energy for water treatment. Some of these systems use UV light treatment, multiple pumps, and filters to make sure the collected water is treated to EPA safe drinking water standards. Rainwater is characterized as grey water in many states like New York, where rainwater is simply not defined in theNew York State codes. However it is defined in the International Code Commission’s (ICC) International Green Construction Codes (IgCC). Currently there are 16 states with rainwater harvesting. These states have different regulations and benefits for participating in rain harvesting for plumbing purposes. Only a few of the 16 states have adopted the ICC green construction codes: Arkansas, Colorado, New Hampshire, and Washington have adopted IgCC codes within the local governments. District of Columbia, Florida, Maryland, North Carolina, Oregon, Rode Island have adopted it state wide. New York State codes are transitioning to ICC authority. It is questionable as to what will change in the state’s building code and if the state will adopt the IgCC. To go beyond the barrel, we are looking to either adopt a rainwater conservation code from the IgCC or to create a new and improved New York State codes through the ICC code approval. This code will allow New York residents to participate in conserving rainwater. New York’s codes may change to adopt the ICC green codes or may not. Either way, adopting the habit of conserving water is crucial for the future development of the nation. I spent today laying lines of kelp for one of the ongoing research projects just outside of Trondheim with my colleagues at SINTEF Fisheries and Aquaculture. You may not know it, but seaweeds are not only a food resource (and for more than just sushi wraps! ), but also a feedstock for a variety of useful products such as alginates, iodine, and mannitol. More recently, there is growing interest in the use of seaweeds for fish food, or even livestock feed. All of these processes produce waste products; in a carefully designed system, these wastes could be recovered for energy and additional nutrients, increasing the value of the system. In fact, this idea pretty much sums up a biorefinery: a facility that integrates biomass conversion processes and equipment to produce fuels, power, heat, and value-added chemicals from biomass. The great thing about a macroalgae biorefinery is that macroalgae are primary producers –organisms that produce biomass from inorganic compounds -- in this case using photosynthesis. This means that products derived from seaweeds involve much less energy cycling to produce, and are also carbon-friendly. Even the sea otters know this! Another great thing is that their growth occurs in the ocean, where there is no competition for land-based agriculture and no demand on increasingly stressed freshwater resources. Third, growing seaweeds in the ocean allows recovery of nutrients otherwise wasted from anthropogenic (human-made) sources such as wastewater treatment plants, fish farming operations, or urban and agricultural runoff -- nutrients that could lead to ecosystem degradation in coastal environments if left unchecked. So today, we laid seaweed lines as part of a research project to determine how growth within nutrient rich plumes near fish farmingoperations alters their growth rate and composition (which affects the quality of the products that we can make from them). Seaweed farming is rather simple, actually. It starts with production of seaweed from spores in the laboratory by seeding long spools of string, and allowing them to grow in tanks with grow lights. We did this a few weeks back. After they start to grow, the strings are wound around ropes to provide structural stability for growth in the ocean. We accomplished this using a small mechanical device that was built by students at NTNU for this purpose. In the device, the rope is fed through automatically, and the seeded string wound around the rope after being tied on. Feeding system - the string is being changed from one spook to another to continue the attachment of seaweed to the long line; close-up view of the inside of the machine and while the finished spool is being changed; and opposite side of the machine automatic winding of the string around the long lines. This machine was designed and constructed by students at NTNU for this purpose. We took the wound long lines out to the farm site -- in this case the background site where there was no fish farm -- and attached them to mooring lines that were previously set. It could not have been a better day for the work -- beautiful weather along the magnificent Norwegian coastline made the day's work progress quickly. Based on the typical growth times, we will be revisiting the farm in May or June to harvest our seaweed. I look forward to seeing how well it has grown and also to learn more about the effects of nutrient enrichment on growth rate and composition of this crop of the future. Stay tuned!!! In the meantime, below is some additional information on Primary Producers and Biorefineries followed by a small slideshow of the beautiful coastline where we deployed our farm – enjoy!